When it comes to cinematic adaptations, Anime is second to Video Games in holding a poor track record. What makes the original so compelling is often lost in translation, as good ideas fall by the wayside in order to anglicise the story and characters. Many months after Ghost in the Shell disappointed, Adam Wingard's adaptation of Tsugumi Ohba's story one-ups it by acting as an outright insulting adaptation, and a poor story in its own right. 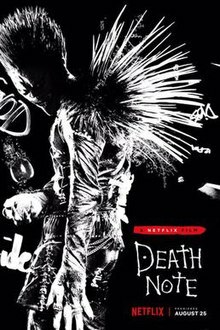 Bright student Light Turner (Nat Wolff) comes across a mystical notebook, entitled "Death Note". It bears the power to kill whoever's name is written in its pages, and comes with a Death God named Ryuk (Willem Dafoe). Light uses this opportunity to launch a crusade to rid the world of criminals, under the name of Kira, but soon finds himself pursued by a detective who goes by the name of L (Lakeith Stanfield). The lead, named Light, is a far cry from his original characterisation. Originally, he's characterised as a calculating genius with a god complex, who has his own moral sense of justice, and refuses to let anything get in the way of his progress. In this version, he becomes a screechy teen that's seemingly intent on using the Death Note to impress his girlfriend. Not helping things is Nat Wolff's performance, as he feels miscast in the role. Late attempts to showcase his intellect falls flat, as it feels out of place with this bland take on the character. If anything, Mia feels more like the rightful heir to the Kira title, as she's more of an active participant in committing to the punishment of criminals. She even instigates Light into perpetrating said acts, which feels like an ill decision. Margaret Qualley is clearly having a ball in the role, but their romance is unengaging, and laughably cheesy. This culminates in a cartoonish scene, where the two decide who to kill in-between snogs. On the flip side of the coin is L, the investigator who's determined to bring Kira to justice. A character originally written to abide by his own moral code, refusing to allow himself to get emotional, he is turned into a hothead that's willing to disregard the code for his own gain. It's a shame the character is so poorly defined, as Lakeith Stanfield embodies the character rather well. Another terrific asset is Willem Dafoe, who breathes life into Ryuk with a performance that lights up the character, which is ironic since he's left in the shadows.It's a shame the character is relegated to listing whatever rule is suddenly relevant to the plot. What drove the source material was a compelling cat and mouse game, where the two leads would match wits and constantly attempt to outsmart one another. Coupled with this is the main theme, about corporal punishment and the right to take lives. This aspects have disappeared, and in their place, lies a rushed tale with little of interest. What begins with the promise of a Final Destination style horror, complete with gory deaths, devolves into an uninteresting thriller where heavy handed and expository dialogue are as common as breathing. This is all before cramming in a forced chase scene, and things only get more convoluted from there. It doesn't have to follow the source material beat by beat, but there has to be something of worth replacing it, and sadly, there's no such thing here. Death Note is a woeful and insulting adaptation which fails to understand character or story. It also fails to be much better in its own right. If anything, it resembles Fant4stic and Dragonball Evolution more than it does its own source material.